Mustard greens and Spring vegetables are making their way to the markets. 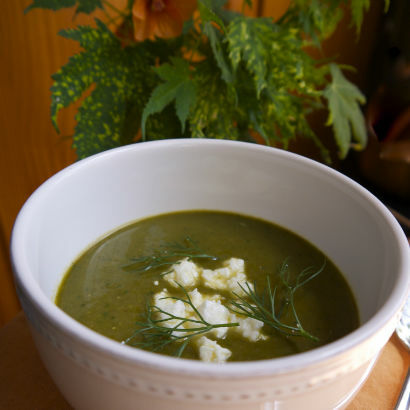 Vivrant green colors scream Spring and make the most delicious soups. This recipe was adapted from a favorite cookbook of mine Love Soup by Anna Thomas. I pretty much stayed true to her quantities only swapping out a few of the ingredients, specifically the sorrel for mustard greens, and adjusting the garnish. Give this spring vegetable soup a try, it’s easy and quite tasty. Click this link: to read more about Mustard Greens by our Seasonal Chef, Maria Reina. Mustard greens have bright spicy bite, reminiscent of Chinese mustard. Combined with asparagus and spinach you will end up with a wondering Spring soup. Separate the white and pale green part of the spring onion. Chop into 1" pieces and sauté with olive oil and a pinch of salt and pepper. Cook for 10 minutes until golden brown. Chop the dark green parts of the onion and set aside. You should have about 2 loosely packed cups. Prep the veggies: Remove the tough outer layers of the fennel, to reveal the tender inner part. Chop into 1/4 " dice. Reserve the fronds. Chop the asparagus and smash the garlic. Set aside. Prep the greens: Roughly chop the mustard greens and spinach. After the onion takes on a nice golden color add the water and turn up the heat. Add the vegetables, greens and rice. Bring to a boil, add the stock, 2 teaspoons of salt and 1 teaspoon of pepper. Lower the heat to a simmer and cover. Cook for about 15 minutes. Remove the lid, turn off the heat and mix in the mint. Let the pot cool for 5 minutes. With an immersion blender puree the soup. Taste for seasoning and add salt and pepper as needed. Garnish with crumbled feta and fennel fronds. If you start with a bulb of fennel that this about 1 1/4 lbs, you will have what you need for the recipe. After removing the tough outer layers you should have about 1/2 lb a perfect amount for this recipe. 1. Separate the white and pale green part of the spring onion. Chop into 1″ pieces and sauté with olive oil and a pinch of salt and pepper. Cook for 10 minutes until golden brown. 2. Chop the dark green parts of the onion and set aside. You should have about 2 cups. 3. Prep the veggies: Remove the tough outer layers of the fennel, to reveal the tender inner part.Chop into 1/4 ” dice. Reserve the fronds. Chop the asparagus and smash the garlic. Set aside. 4. After the onion takes on a nice golden color add the water and turn up the heat. Add the vegetables, greens and rice. Bring to a boil, add the stock, 2 teaspoons of salt and 1 teaspoon of pepper. Lower the heat to a simmer and cover. Cook for about 15 minutes. 5. Remove the lid, turn off the heat and mix in the mint. Let the pot cool for 5 minutes. 6. With an immersion blender puree the soup. Taste for seasoning and add salt and pepper as needed. 7. Garnish with crumbled feta and fennel fronds. You will start with a bulb of fennel at this about 1 1/4 lbs. After removing the tough outer layers you should have about 1/2 lb, the perfect amount for this recipe.